This map was originally available from Gruntz - The Journey Home which no longer supports downloads. GooRoo discovered it while searching for puzzles without a "PERFECT!" Statz Page image, and found that it was impossible because it had no Secretz and no Coinz. The main Grunt entered the map with everything needed to proceed! 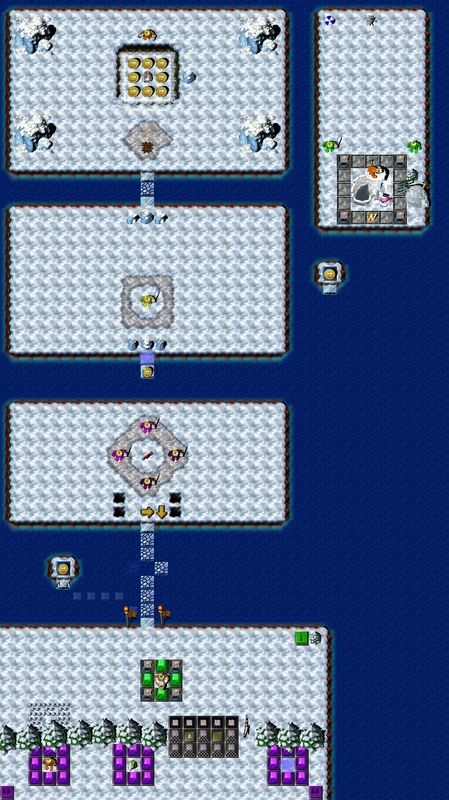 So items were removed from its entry possession, and elements were added under Giant Rockz that needed to be 'processed' in order to proceed to the next area. Part of that was to add a Question Mark Switch puzzle in the first area. Also, a number of Tilez #001 were enhanced with some additional Tilez, strictly for appearances sake. In the second area, a SecretTeleporterTrigger was added, to acquire the Warp Letter. Swietymiki added some more Tile enhancements, and provided a bit of a change with enemy Gruntz, provided a final (trimmed) "View the map!" and speedy "Statz Page" images. In the released version, the only thing missing is a Powerup. I discovered that I had this very old Quest from 2002 that has never been available (to my knowledge) anywhere! The basic puzzlez are from the original WWD; all of the land areas are unchanged in size; two small islands I added ... and I filled in stuff in several places; added a Question Mark Switch mini-puzzle, and a Red Warp (for the Warp letter). There is nothing at all difficult about the puzzle, barring the timing for the QMS part, so its highest difficulty level is 'Easy' ... possibly 'Very Easy'. All of the Giant Rockz are my addition, so that instead of the main Grunt arriving with everything needed, some effort is now required to obtain things. The download link works (or it will after I test it and find it wrong), so anyone may play it immediately. Probably not worth distribution to all of the Gruntz Fanz. Was the magic shovel a part of the original puzzle? No, and I made it very obvious which Holez are to be re-dug to obtain goodies. There were no Coinz at all in the original map. Made some additional changes. I know it wouldn't be a Blaze level without the rectangular areas, so I only cut them a little bit to make the islands symmetrical with passages in the middle, and had to move some logics around. Also changed the Red Spell zone, now not all Gruntz are post guardz so you can't just walk past without being attacked. I have SAVEd all three files to my hard drive, adding a '3' to the file names, so nothing has been lost. I plan to rename the original files with '2002' added to their file names, so that simply 'TheSnowLevel' will continue to work after all the renaming at the Forum's web host. (I was simply unwilling to spend the time shrinking the map, with the logic movements necessary to do that. The nature of the puzzlez is such that the platforms could all easily be reduced in size (vertically, at least ... only 1 excess tile horizontally). Since there are no logicz associated with the added four Holez, I see no value there.Perhapz I will see them come into play with the changed nature of the four enemy Gruntz. Is this going to be published before Christmas? So you believe the twice re-worked map is worthy of distribution? Yours is the only comment about the puzzle, so I thought nobody else cared. I have been trying to get my newly purchased LightScribe disc drive working so I could finssh Christmas presents, only to be informed by the supplier today that it should not work with a Windows 10 computer! And there is not enough disc space on my XP computer (on which the drive is recognized!) to add the LightScribe capable software. That is the reason why I have not pursued distribution of this very old puzzle. Now that my hopes have been dashed, I will go ahead and release the final map.